To celebrate his 21st birthday, Rafael went snowboarding with his friend in El Colorado, Chile. He noticed a strange-looking rock in the distance, and soon realized it was no rock at all, but a stranded wild horse trapped in snow. Knowing the poor horse would surely die, Rafael and his friend leapt into action. 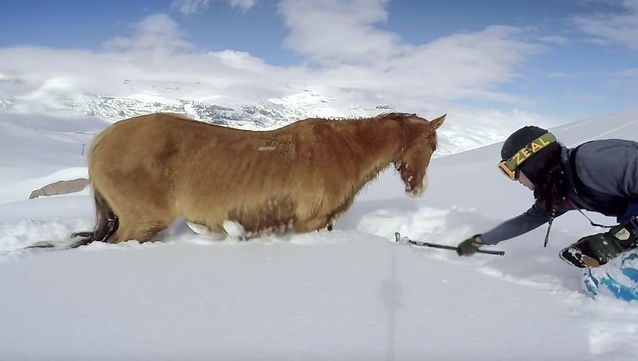 If the snowboarders hadn't come along, it's not likely the stranded horse would have lasted much longer. And while riding the slopes might have been a more pleasant way to spend the day, Pease says he wouldn't have had it any other way. Responses to "Snowboarders Save Stranded Horse From Freezing To Death"
This literally had me in tears! how wonderful... lovely, genuine and caring young men!!! I realize the horse was probably dehydrated but I hope the owner is feeding her a lot more now. She must have been terribly thin to begin with. ...thanks to the rescuer - and also thanks for sharing - well done :-) (y)! It shouldn't have been dehydrated, animals can eat snow for hydration. I agree must have been really thin to start with. Great kids, to help out this animal. Gosh when I am witness to such miraculous events I do wonder at the alchemy of it all. Wish I were able to follow all the characters in this miracle and see what has transpired because of this Kindness and the Synchronicity of circumstances. four frigging days? didn't the owners look for her? The best living creatures on this earth are humans who are kind. I wish they were the majority..
Kindness and compassion indeed, won the day,it feels so wonderful to save a life even by others. Thank you guys. Fist off, when a horse dehydrated the back end, under the belly gets sucked up. That doesn't cause the ribs to show. Second, when a horse has a winter coat and you can still see a rib cage line, that is one thin horse. This coming from a person that cares for 120 horses at a time. Believe me you watch for every little thing that might go wrong, including too much packed snow in the hooves.